Canada, stretching from the U.S. in the south to the Arctic Circle in the north, is filled with vibrant cities including massive, multicultural Toronto; predominantly French-speaking Montréal and Québec City; Vancouver and Halifax on the Pacific and Atlantic coasts, respectively; and Ottawa, the capital. It’s also crossed by the Rocky Mountains and home to vast swaths of protected wilderness. From east to west, the country encompasses six time zones. Canada shares a 5,525-mile boundary with the U.S. The Atlantic Ocean hugs the coastline to the east, the Pacific Ocean to the west. The country is made up of 10 provinces and three territories. When it comes to geography - diversity is the word. Fertile plains, vast mountain ranges, lakes, rivers, wilderness forests and Arctic tundra to the far north. Canada has a population of about 32.5 million. The official currency is the Canadian dollar. In random order, the major cities are Victoria, Toronto, Vancouver, Montreal, Ottawa, Calgary, Edmonton and Halifax. The country enjoys four distinct seasons and six time zones. English and French are the two official languages. English is the mother tongue of 59 per cent of the population. Canada has 11 national holidays: New Year's Day, Good Friday, Easter Sunday, Easter Monday, Victoria Day (Monday preceding May 25), Canada Day (July 1 or July 2 if July 1 is a Sunday, Labour Day (first Monday of September), Thanksgiving (second Monday of October), Remembrance Day (November 11), Christmas Day and Boxing Day (December 26)and new to 2008, February 18 is Family Day. The maple leaf is the national symbol. On arrival, transfer from Vancouver International Airport to hotel. In the afternoon visit “FlyOver Canada”, best of Vancouver’s attraction which offers a spectacular virtual Flight over Canada. Rest of the day is at leisure. Overnight in Vancouver. After breakfast, proceed on Vancouver City with Capilano Suspension Bridge Tour. This tour has it all! See Canada Place, Robson Street, Sports Venues, the library, theatres, Chinatown and historic Gastown. Make stops in gorgeous Stanley Park on to Cleveland Dam and the Capilano Suspension Bridge. 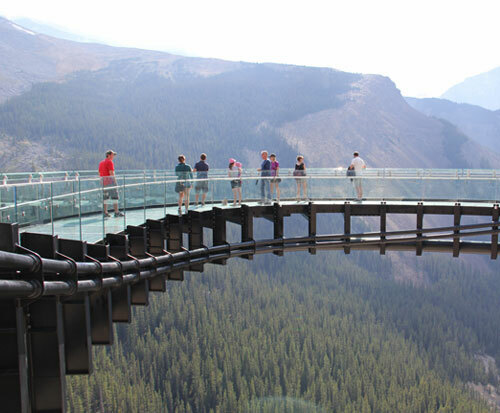 Cross the 450-ft- long bridge over a spectacular canyon to the Treetops Adventure. The Cliffhanger attraction is worth the trip alone. Overnight in Vancouver. After breakfast, continue your journey west, passing through grassy rolling hills and Ranchlands to Okanagan Lake Country. The landscape transitions into forested hills, orchards, and expansive lakes, winding through a series of scenic valleys. Witness the landscape change from wide-open skies to towering, rugged peaks as you ascend into the Rocky Mountains. Stop for lunch in the alpine town of Revelstoke before continuing through the untouched wilderness of Roger’s Pass. Overnight in Lake Louise. After breakfast, travel to the Columbia Icefields along the spectacular Icefields Parkway with photographic stops at Crowfoot Glacier and Peyto Lake. At the Icefields Centre, take a unique ride on the all-terrain Ice Explorer and then explore the magnificent Glacier Skywalk. Late afternoon, transfer to Banff. Overnight in Banff. After breakfast, proceed on Discover Banff Tour. The resort town of Banff is set amongst the towering mountains of Rundle, Tunnel, Cascade and Norquay. A gentle ride on the Banff Gondola takes you to the summit of Sulphur Mountain for a 360 degree panorama of the Bow Valley. Spend the afternoon at leisure to explore famous Banff Avenue. Overnight in Banff. Meals and attractions unless otherwise stated. Train station transfers are not included in the package. Common pick-up and drop-off point for sightseeing tours from central location. Any type of mandatory fee like a resort fee / city tax etc. has to be paid at the hotel directly; the same is not a part of the package and cannot be prepaid. Passenger will have to reach on their own to common pick-up point (Bus station) in Montreal for transfer to Quebec City (Bus station).